The Self-Absorbing Man: Happy Mother's Day! Thanks for all the costumes, Mom! I didn't turn out as weird as was feared. And thanks to you Sbarro's (pictured in back) for those soft as snow, pudgy thighs. Awesome. 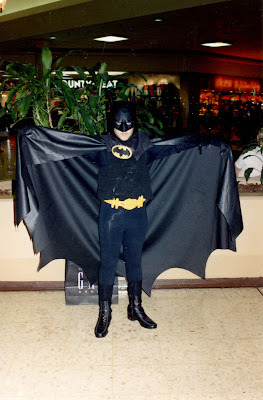 My Mom made me a Batman costume as well when I was a kid....and yes damn you Sbarro's! oh gee whiz, thanks and welcome. black lycra conceals great quantities of stored calories, and wickedness.